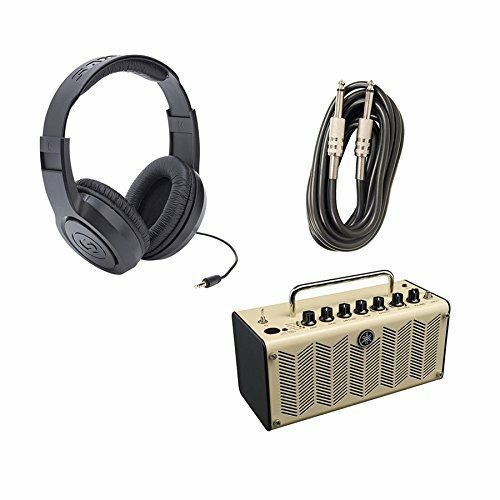 Yamaha THR5 Desktop Guitar Combo Amplifier The Yamaha THR5 10 Watt Guitar Amplifier is a portable 10 watt guitar amplifier with built-in amp modeling, effects and tuner. Featuring two 3" speakers, the THR5 can be powered with the included power supply or with eight AA batteries for on the go playing. The Yamaha designed speaker enclosure has been optimized to handle both guitar from its 1/4" input and stereo playback from its 1/8" auxiliary input. The SR350 Over-Ear Stereo Headphones from Samson are circumaural, closed-back dynamic headphones with 35mm drivers and a 20 Hz to 20 kHz frequency range. They can be used to deliver a solid performance and effective isolation when monitoring audio for music playback, classroom listening, fitness applications, and more. When it comes to live sound, recording, and electric instruments, these quality Axcessables cables are a vital tool.